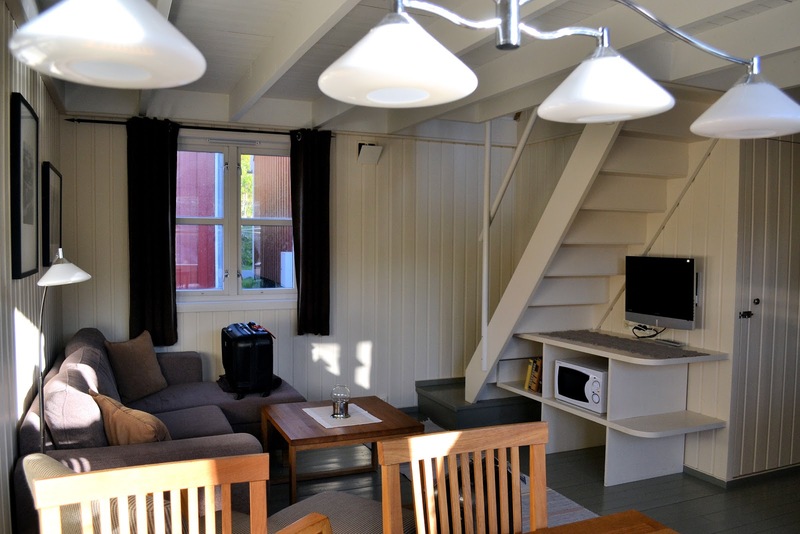 Welcome to your cottage by the sea—Norway's charming rorbuer or fishermen's cabins. 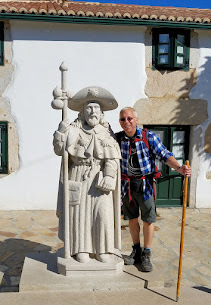 All photography unless noted is the property of EuroTravelogue™. Unauthorized use is prohibited. 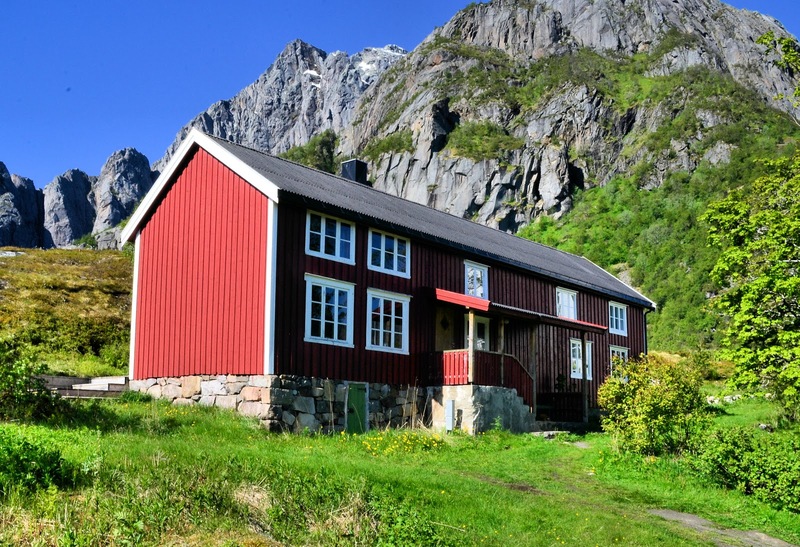 Picturesque and cozy with over-the-top rustic charm doesn't begin to describe these winsome retreats that became my home while exploring the Lofoten Islands above the Arctic Circle in Norway. 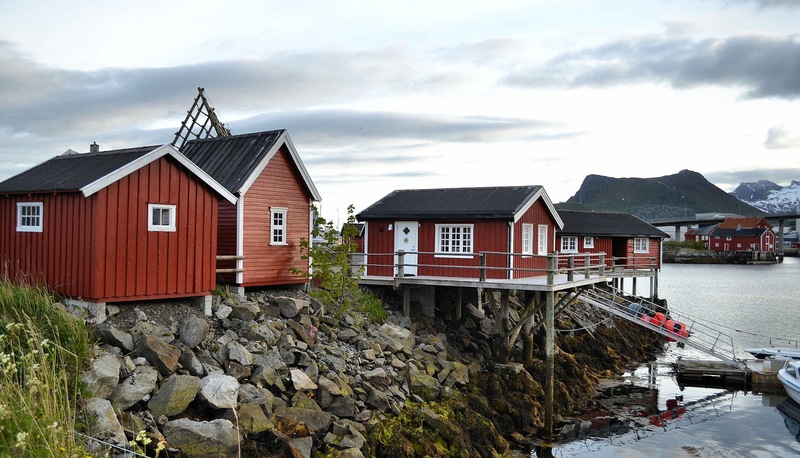 Nestled amid the most idyllic settings imaginable and steeped in Norway's cod industry, Rorbu cabins (plural rorbuer), more commonly known to travelers as fishermen's cabins, are those pretty little red cottages that cling to the shores throughout the Lofoten Islands. Throughout the centuries, they have provided accommodations for fishermen and tourists alike and although they have come a long way since the days when they provided shelter for the rugged men of the sea, they retain all the character and charm of their predecessors albeit with modern-day conveniences. 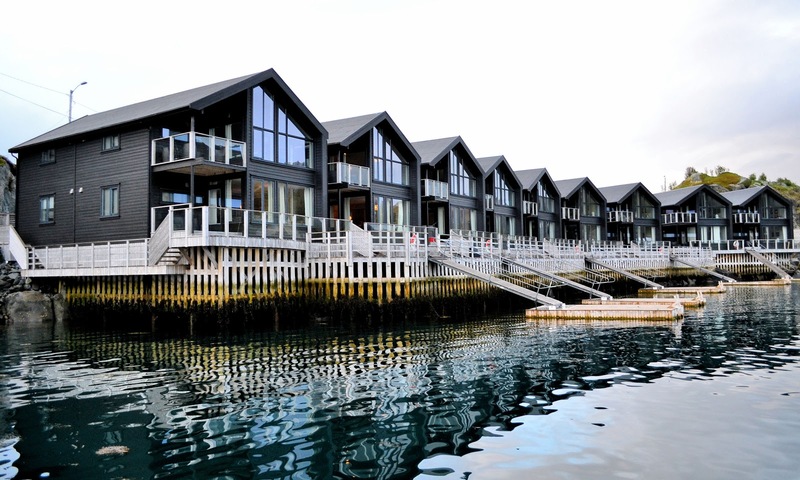 Primarily concentrated in the Lofotens, they are sprouting up throughout Norway because of the appeal of their unique architecture and cozy habitation surrounded by the solitude of the sea. While kayaking with XXLofoten, my kayak pilot Miriam explained that these rorbuer date back to the 18th century. During my Arctic expedition in northern Norway, I fell in love with rorbuer and had the opportunity to stay in a variety of them ranging from "rough luxe" to "deluxe," but wherever you decide to bunk up for the night, I can promise you this. You'll wake to the rising sun as it soars high above the ridge, listen to the laughing seagulls flying overhead and other wondrous woodnotes of Mother Nature, and kiss the moon good night as you succumb to slumber after a day of spectacular adventures. 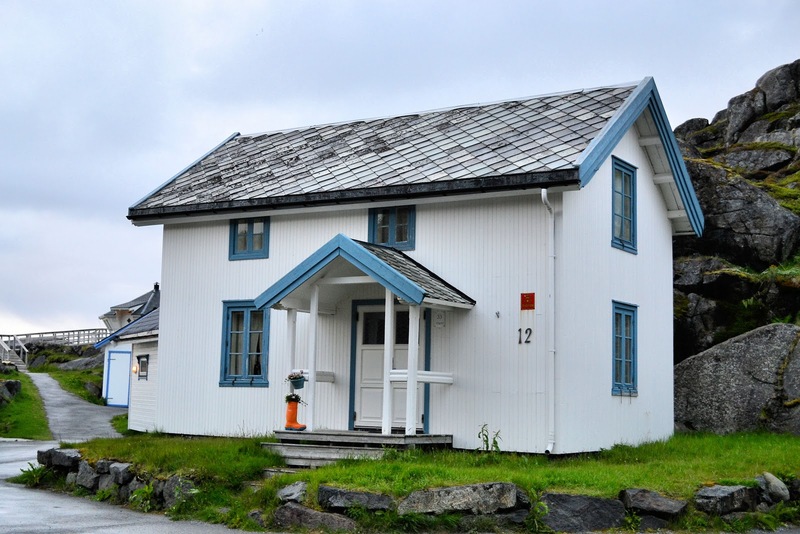 This authentic rorbu cabin in Svolvær, Norway, dates back to 1870. Commissioned by King Øystein in the 12th century, the first rorbu cabins appeared in Lofoten at the beginning of the 12th century when the king ordered winter shelters for roughly 30,000 seafaring fishermen who arrived every fishing season from January through March aboard 6,000 rowboats in search of bountiful harvests. In exchange for their catch, the fishermen received room and board in rorbuer owned by the fish-station proprietors; however, these refuges from the frigid weather were not so warm and snuggly. 19th-century rorbuer in Svolvær, Norway. 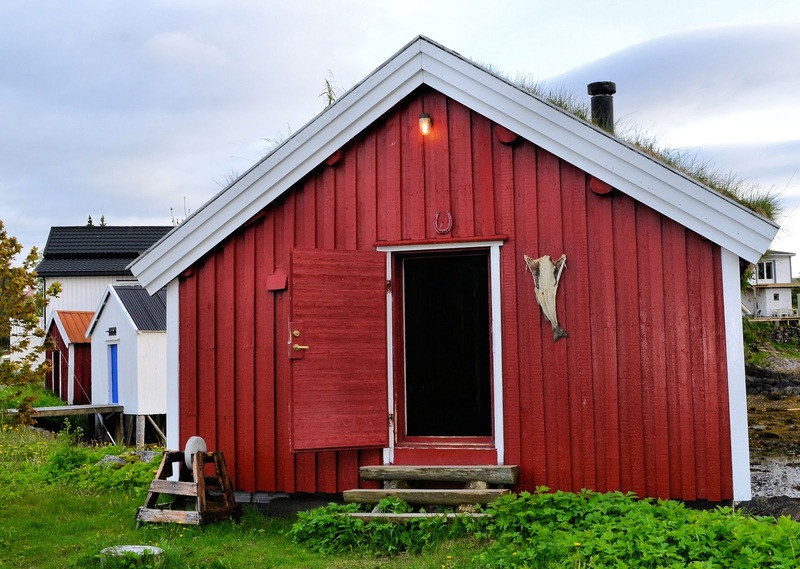 "Rorbu" derives from the Norwegian "ror" (row) and "bu" (small house) and was usually a single-story thatched cabin built on poles and extending out over the water providing easy access to rowboats below. Fishing villages typically had rows upon rows of rorbuer and each one of them could accommodate two båtlag (boat teams) or up to 12 men. 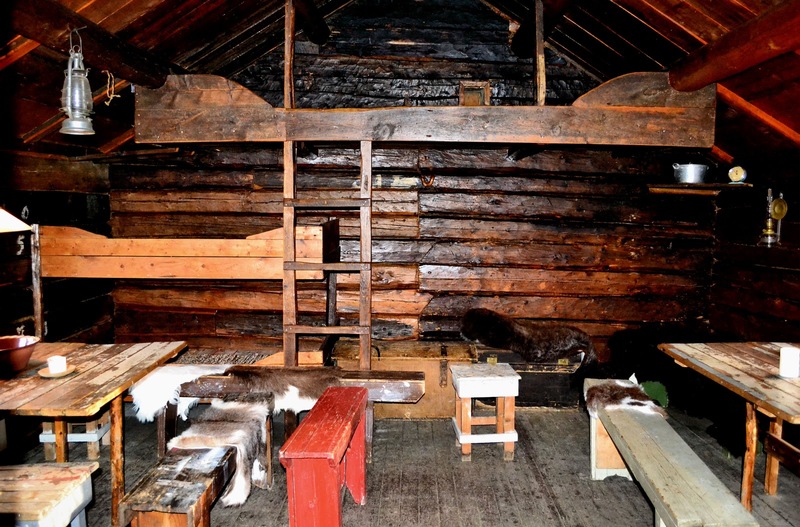 The average rorbu cabin contained two rooms: the front room provided entry and was used to store fishing equipment including nets, salting barrels, lines, tools and the day's catch; while the heated rear was built of logs for insulation and was used as a combination kitchen and bedroom. Inside the rear room was usually a table, cupboard and wood-burning stove; and along the back wall, four sleeping bunks, without mattresses, meaning that at times, three men shared one bunk bed. How's that for not-so-cozy? The odor must have been unbearable owing to the pungent-smelling cod-liver-oil burning lamps, raw and drying fish, sweat and damp clothes. 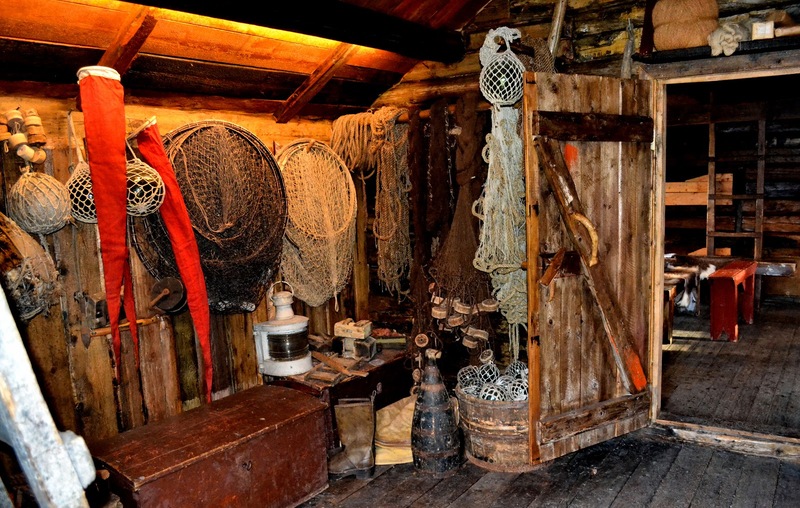 The front room was used to store fishing equipment including nets, salting barrels, lines, tools and the day's catch. 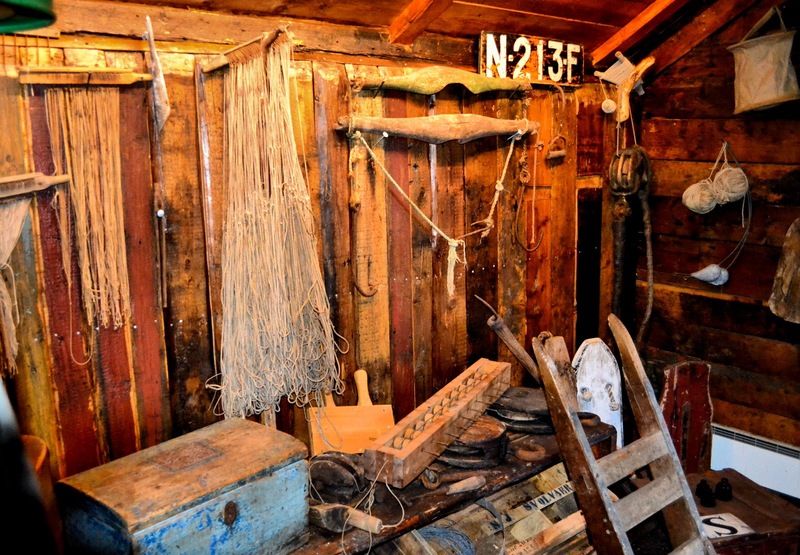 More fishing equipment stored in the first room of the rorbu cabin. 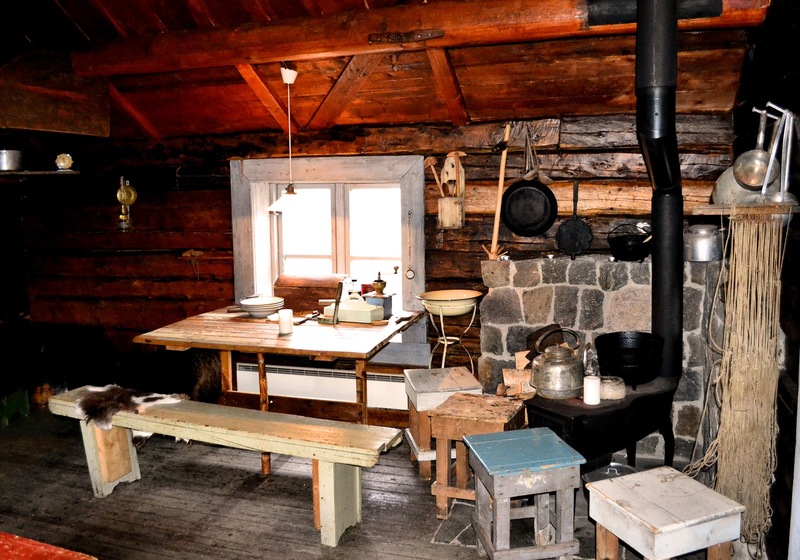 The kitchen included the bare essentials: table, cupboard and a wood-burning stove. Along the back wall were bunk beds that could sleep up to 12 men. 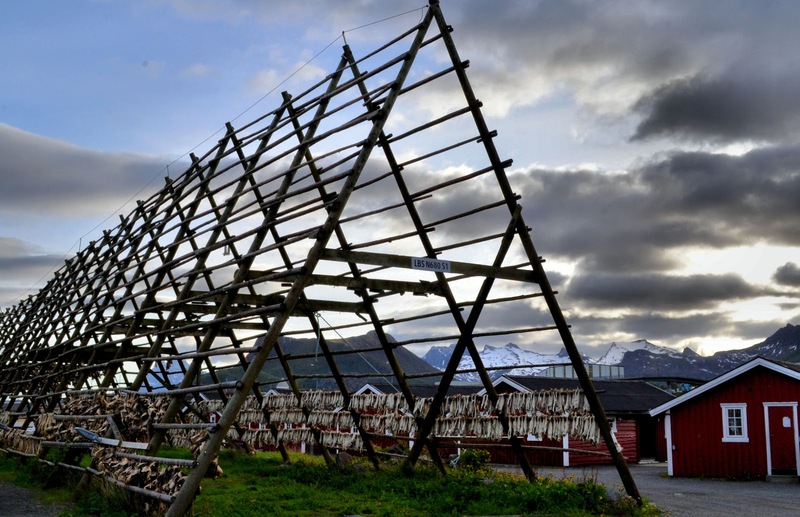 For nearly a millennia, fishermen have dried cod on wooden A-frame racks. You can still see the last of this year's harvest hanging out to dry. From "rough luxe" to "deluxe"
Hamn I Senja rorbuer are at the deluxe end of the spectrum featuring 2-bedroom villas with living, dining, kitchen and balconies along the water's edge. Rorbuer have indeed come a long way since the 12th century and range from "rough luxe" to "deluxe," the former offering the most basic of amenities while the latter offers the luxury of space including kitchens, living rooms and balconies. 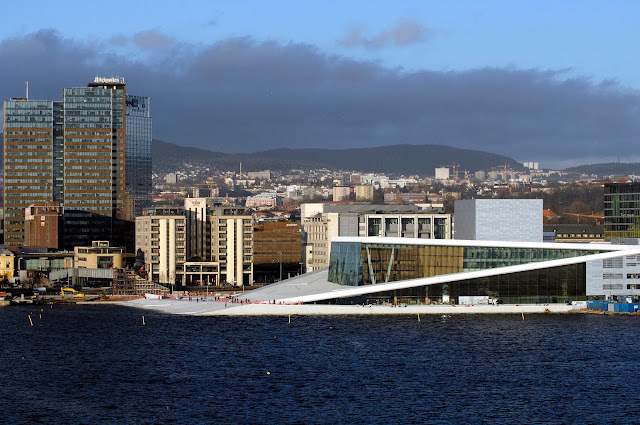 Regardless, you'll always find ribbons of them along the Norwegian coastlines surrounded by the idyllic splendor. 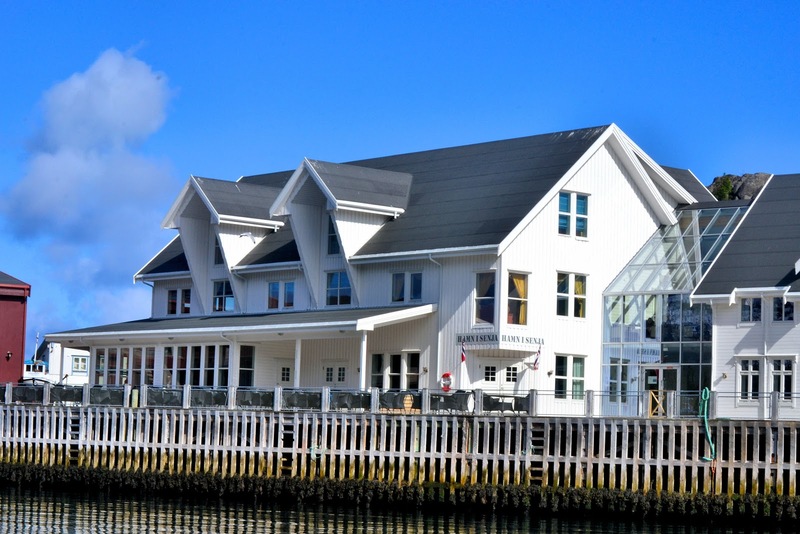 Kalle I Lofoten Brygge - the grand gathering place where you'll find dining, bar and lounge. 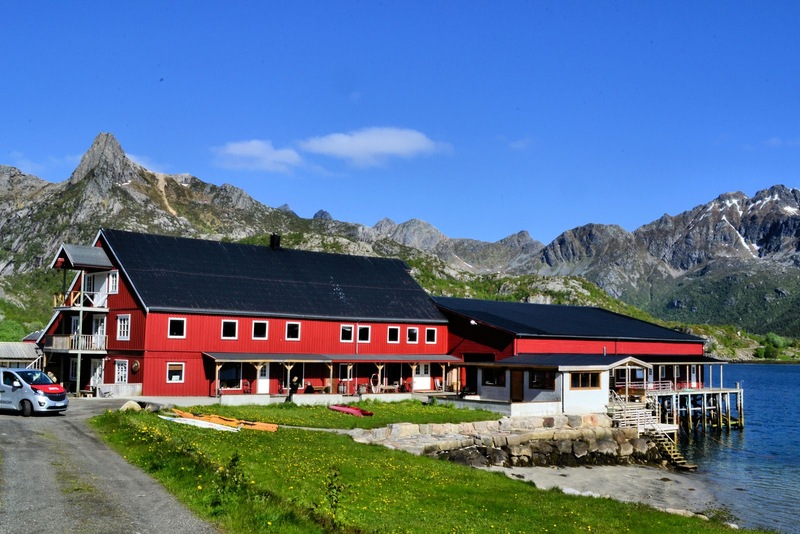 It was summer camp all over again at the Kalle I Lofoten rorbuer. 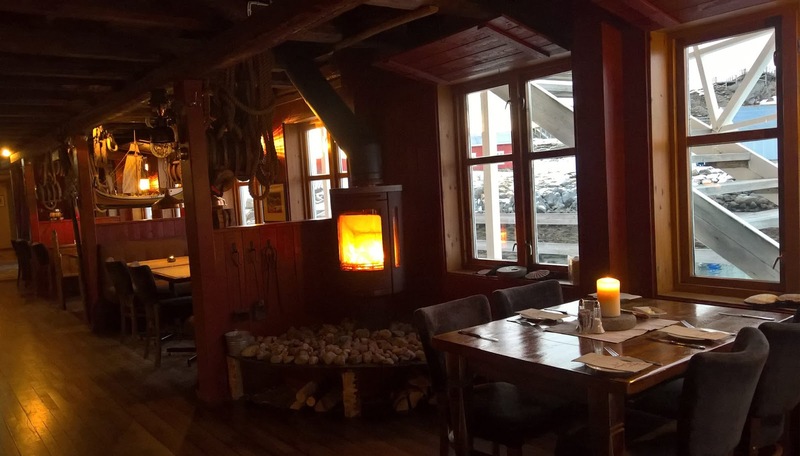 Wedged between soaring peaks and the sprawling Norwegian Sea, the Kalle Rorbu Hotel is "rough luxe" at its best according to hotel manager and hiking guide Maren who described its rustic charm as we sipped our aquavit during the evening of our arrival. Inside the Kalle brygge gathering room. Look closely at the chandelier and you'll see that's made of dried cod. Welcome to "rough luxe." The Kalle brygge gathering room. This is where I tasted my first aquavit. 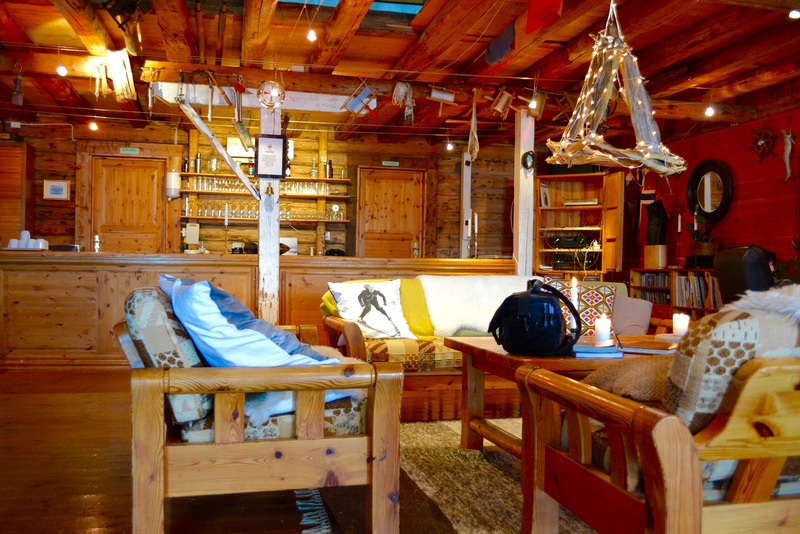 She regaled us with the history of this one-time trading post that now accommodates singles, families and groups in a variety of cabin layouts. 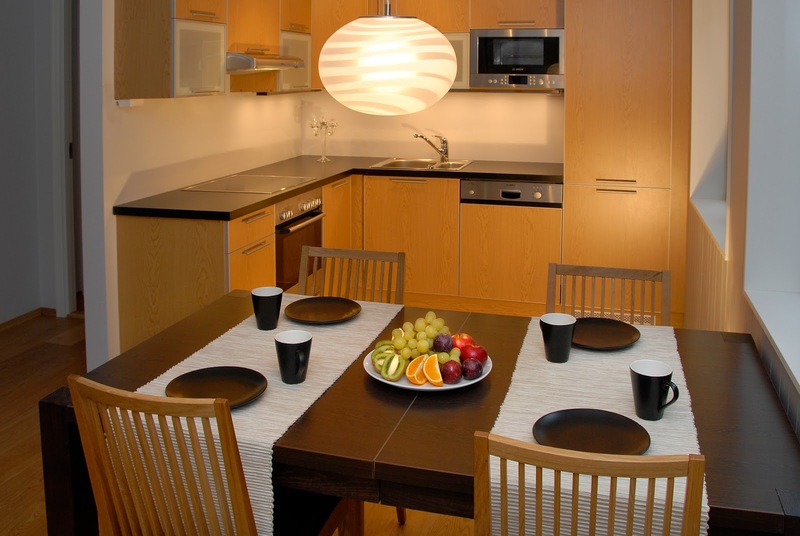 In total, they feature approximately 50 beds, most of which share bathrooms and kitchenettes. Daily meals are served in the Kalle Brygge main building that also houses a gathering room and bar. Outside—nature and lots of it! Hiking trails rise to soaring heights behind the resort, the nearby sea beckons kayakers to ply its waters, and when the day is done, the hot tub and sauna rejuvenate your tired body as you sip your wine and contemplate life. 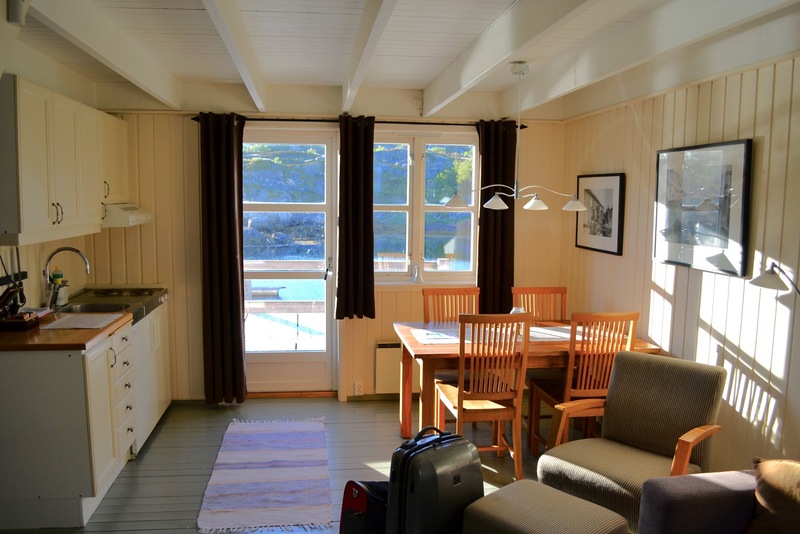 Our cabin at Kalle I Lofoten can accommodate up to 14 guests with five bedrooms, kitchen, living room, two bathrooms and a laundry room. Although six of us shared one house that could easily accommodate up to 14 guests with two bathrooms, living room, kitchen and laundry room, it was like summer camp for all of us. We had plenty of room and it became quite the adventure in and of itself. 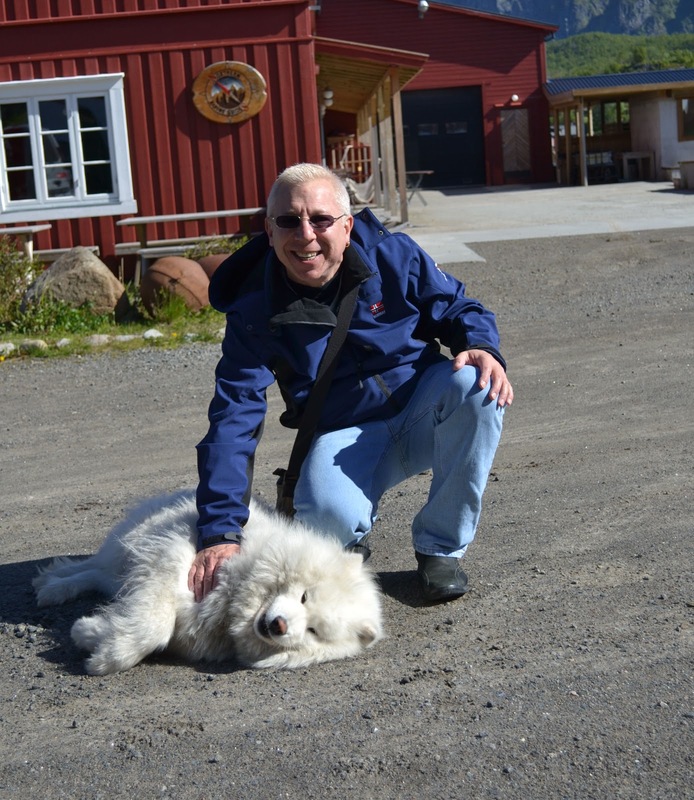 Nanook enjoys a gentle rub as we bid farewell to Kalle I Lofoten. 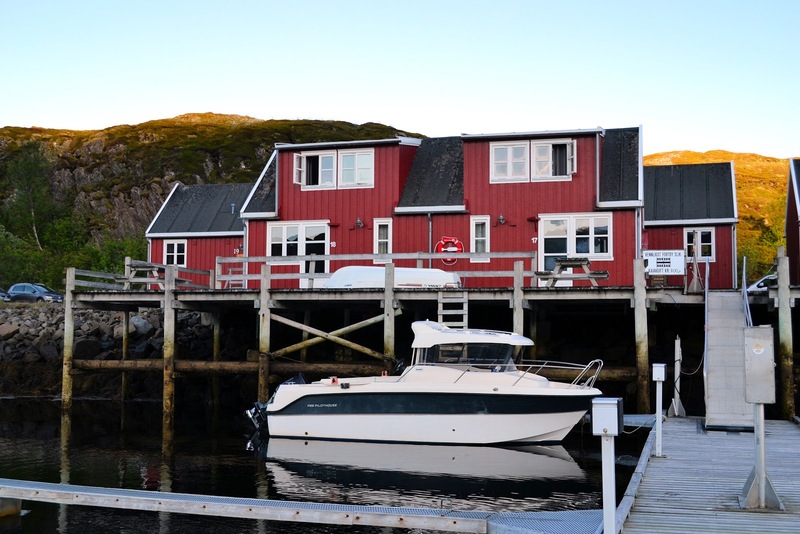 Deluxe rorbuer at Hamn I Senja located on Norway's second largest island—Senja. 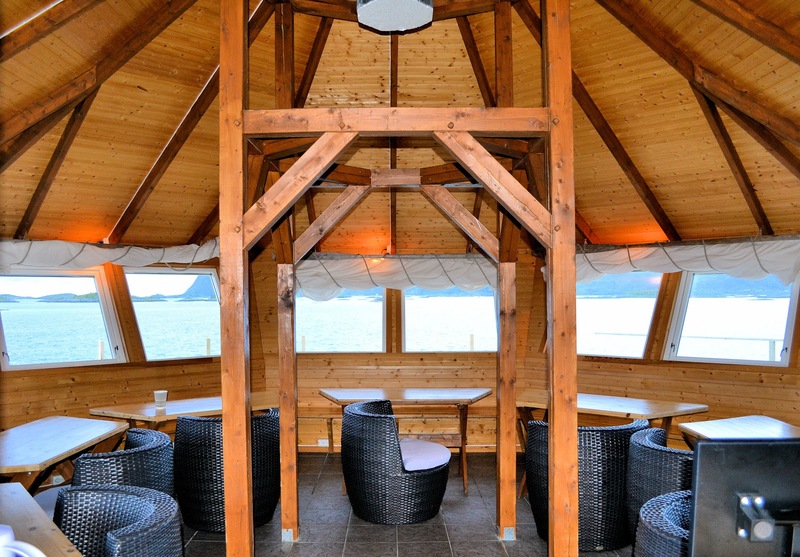 Our "deluxe" accommodations takes us to Norway's second largest island of Senja, Hamn I Senja with its villa-style accommodations and seductive views of the sea. 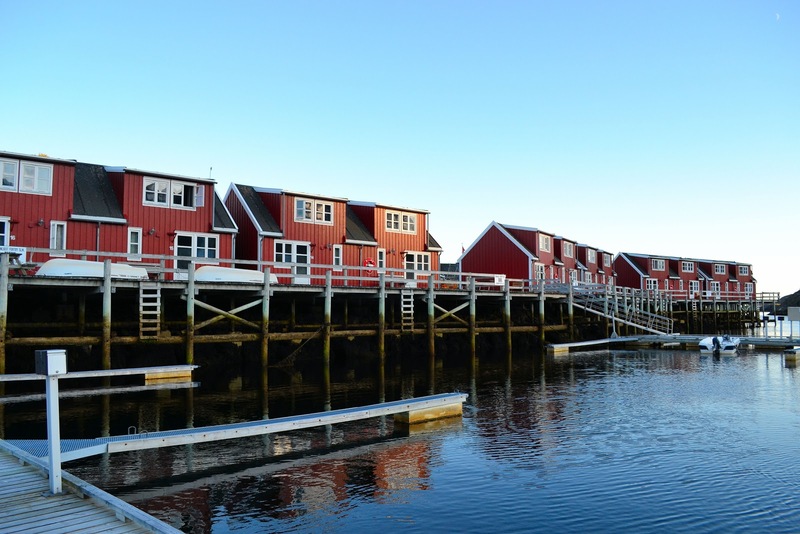 Historically, the area served as a safe harbor (hamn or havn) for fishermen throughout the centuries so it's no surprise that this village takes its name from harbor itself—Hamn I Senja or "harbor in Senja." Welcome to Hamn I Senja, check-in and dining just inside the front door. These modern villas feature two bedrooms, each with full bath; shared kitchen, dining and living room; and balcony. Within its 29 apartments, there are 65 rooms and 135 beds which are perfect for groups of four but if you are traveling alone or as a couple, you'll have to share the common areas with another couple. I recommend you book the bedroom adjacent to the common living areas so you'll have easy access to those rooms, plus a beautiful view of the sea from your bedroom. Shared living room offers spectacular views of the sea. This photo only: © Hamn I Senja. Unauthorized use is prohibited. Kitchen area. This photo only: © Hamn I Senja. Unauthorized use is prohibited. 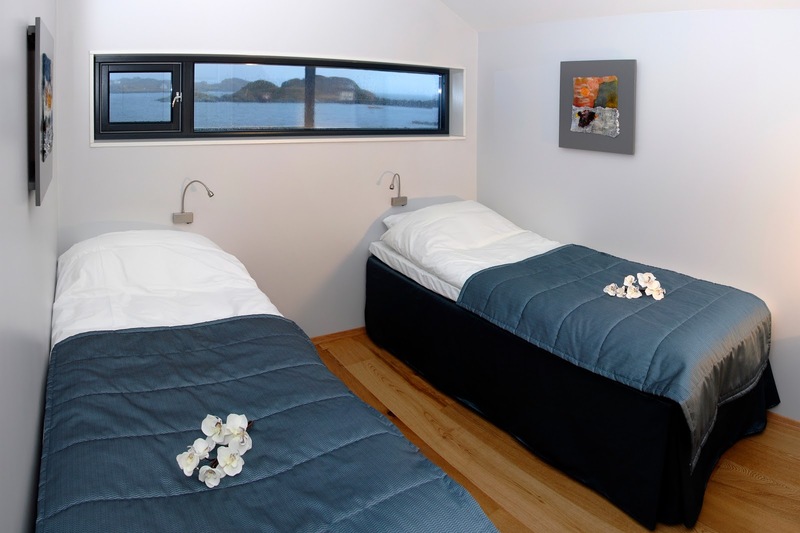 Two single beds are located in the first of two of bedrooms (my recommendation) in each of the villas. Notice the spectacular view outside the windows. This photo only: © Hamn I Senja. Unauthorized use is prohibited. 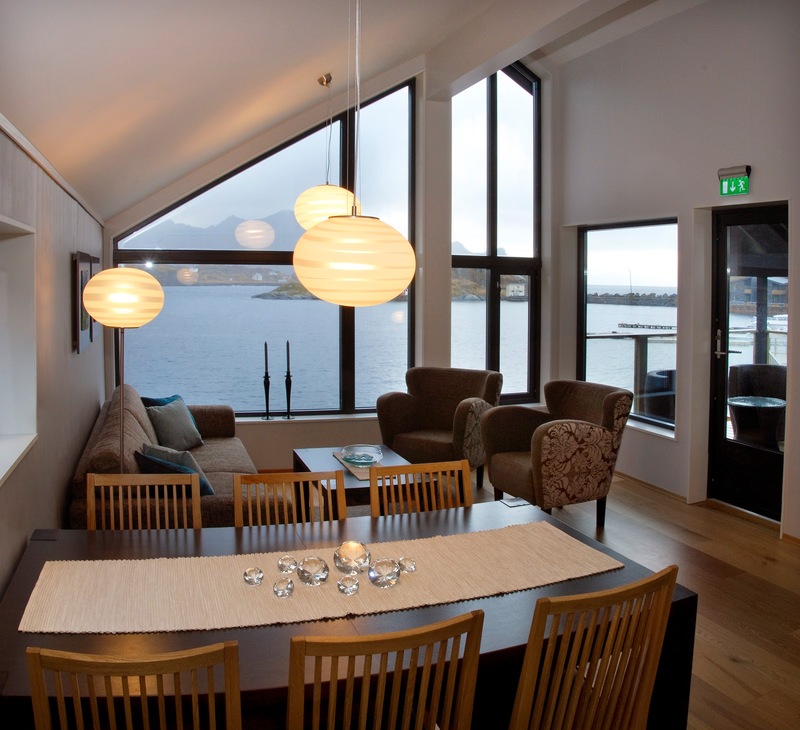 Deluxe villa accommodations will welcome you home at Hamn I Senja. Dating back to 1874 when this budding village opened its first post office, Hamn I Senja continued to prosper throughout the 1870s and by 1881, it developed into one of Norway's largest mining communities replete with grocery store, cod-liver steam house, warehouse, courthouse—among others. Actually you can still see the first telegraph office which opened in 1896. Dating back to 1896, the first telegraph office stands today. 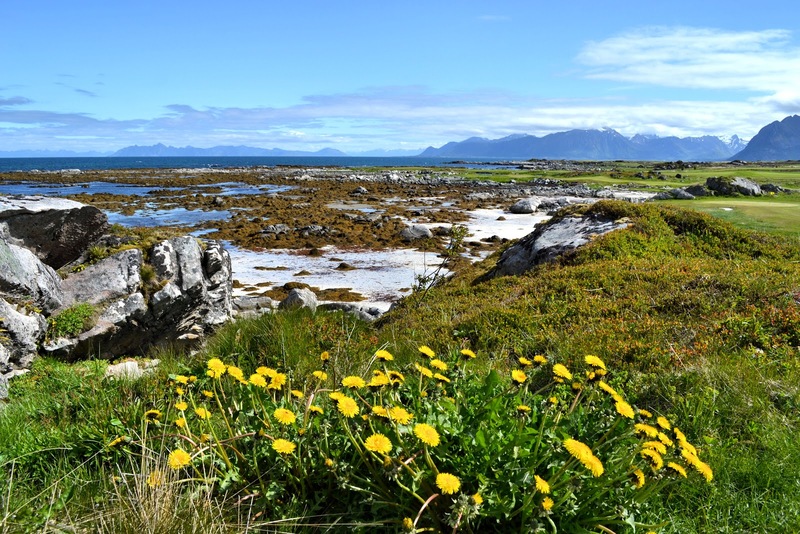 After the fishing industry moved out of the region in 1990, the community amid this northern Norway archipelago was on its way to becoming a resort destination. 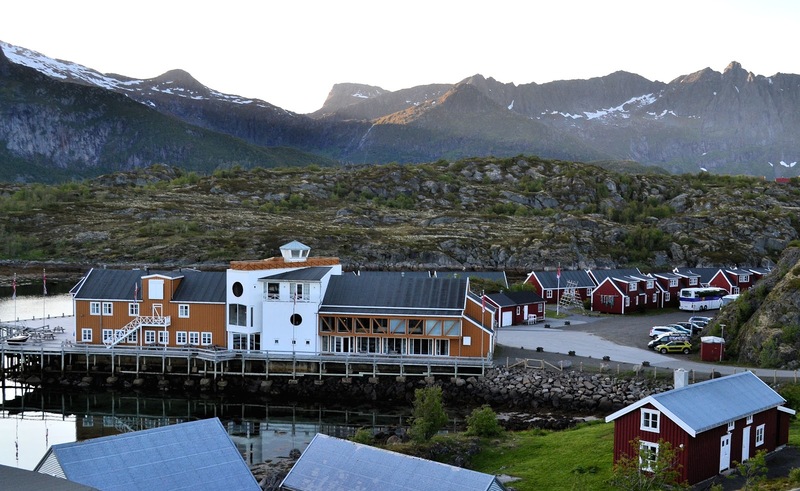 By 1995, Hamn I Senja was voted the Tourism Product of the Year in Norway and in 2011, Visit Norway recognized it as one of the country's leading resort destinations. Hamn I Senja harbor is where we began our sea safari. 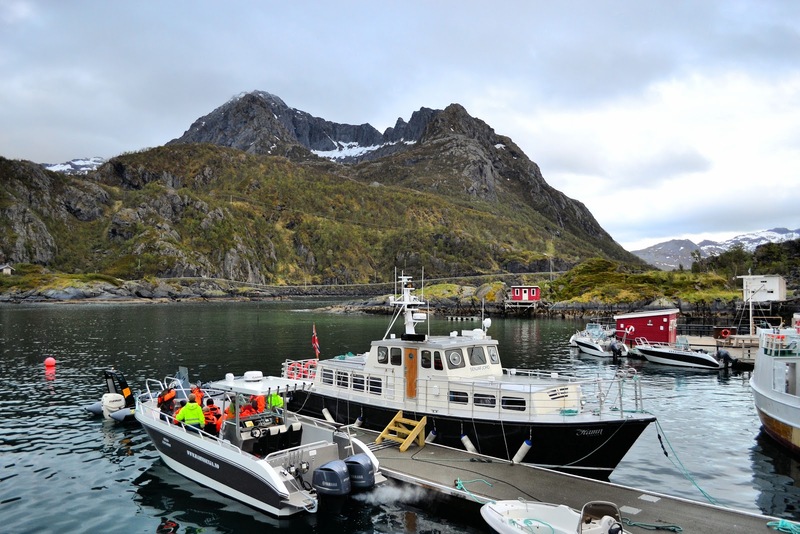 Arctic adventures abound throughout the Lofotens and Hamn I Senja takes great pleasure in organizing encounters with nature and the wildlife for its guests. In January embark on a whale safari, go skiing, or hiking; and most of all, be dazzled and awe-struck by the nighttime dance of the mystical northern lights. If fishing is your game, the sea offers a promising bounty to avid anglers. Much of the same in the summer as well but instead of the Aurora Borealis, it's the midnight sun that will turn darkness into light. 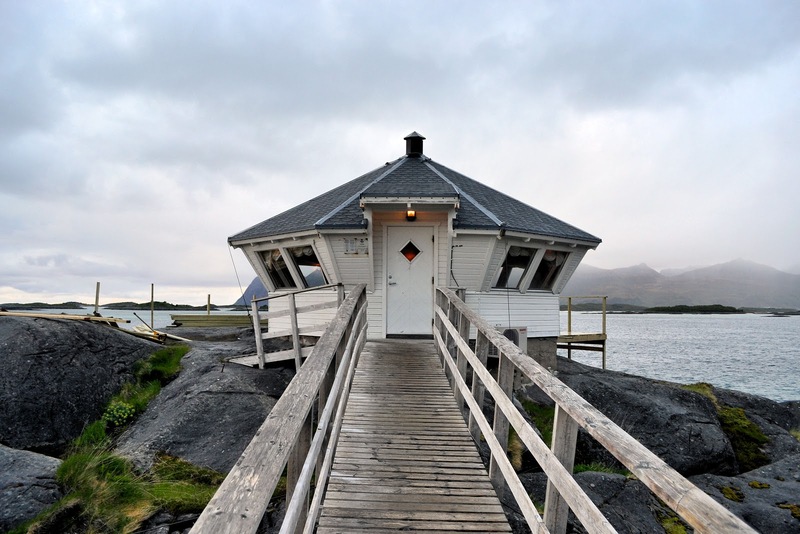 The lighthouse at Hamn I Senja. Inside view of the lighthouse. Beyond the panes, scenic views of the sea. 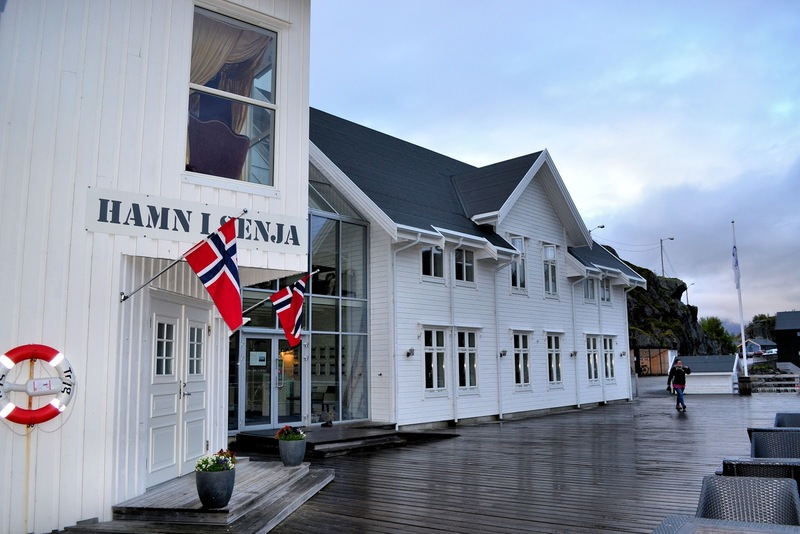 The main entrance and restaurant location at Hamn I Senja. Each night of your stay, you must pre-order your dinner and the restaurant will open only if a minimum number of guests arrive. If the restaurant doesn't open, don't worry, room service will be available with a private chef. And if you're not booked in one of the villa accommodations, you will be upgraded for that evening. Did I mention that the food was scrumptious? The picturesque rorbuer of Nyvågar Rorbuhotell. 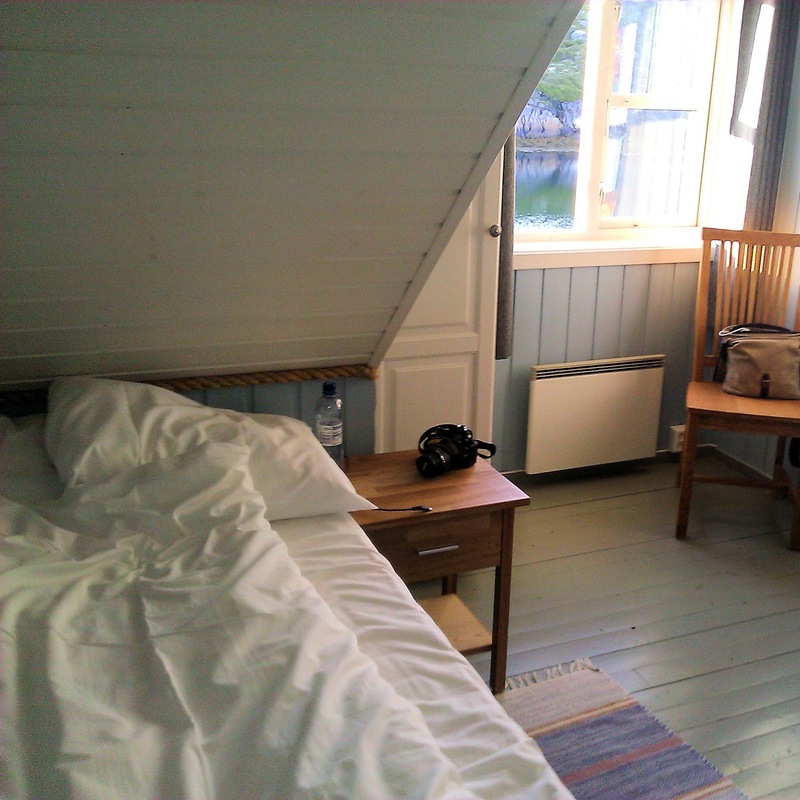 Our last home away from home on our northern-Norway expedition was at Nyvågar Rorbuhotell, quaint rustic cabins with all the ambiance reminiscent of the fishermen's cabins of yore. Kitchen and dining room overlook the fjord. Level one features the main living room, kitchen, dining room and bathroom. Gently lapping waves and a cacophony of seagulls just outside my bedroom window—a tranquil setting amid the Alterosen inlet off the Norwegian sea, I think Nyvågar Rorbuhotell was my favorite because it was my little cottage by the sea—a quaint and cozy cabin, number 18 in fact, with a living room, dining area, kitchen and bathroom on the main floor; and two dormer-style bedrooms upstairs, one of which became my little hideaway by the sea. I never wanted to leave my hideaway by the sea. Cozy accommodations await in the dormer-style rooms above the main living areas. Close-up view of rorbu cabin 18. More views of my rorbu cabin 18, simply the best! 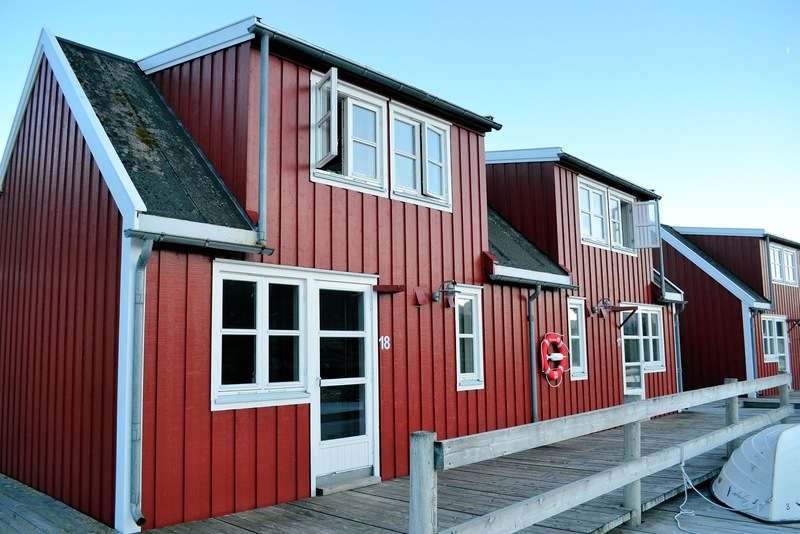 Located in Storvågan, one of the first fishing villages established in the Lofoten Islands, Nyvågar Rorbuhotell is more than just its 30 cabins and two restaurants, it's a journey back in time. During the Middle Ages, Storvågan was home to many a fishermen who cast their nets to reel in the Norwegian-Arctic cod (skrei) and launched a trade center that contributed immensely to Norway's export industry. And even before that, evidence of human settlements dating back 9,000 years was discovered in a nearby cave decorated with mythical stone carvings and paintings including a moose, proof that settlers lived there before the ice receded after the end of the last ice age. Overlooking Nyvågar Rorbuhotell, main building in the foreground. Jumping back to present day, you'll find two restaurants: Enjoy lunch or dinner at Lorchstua where chefs Ove Vollan and Tor Erling Dreyer blend together the best of local ingredients to create culinary masterpieces. 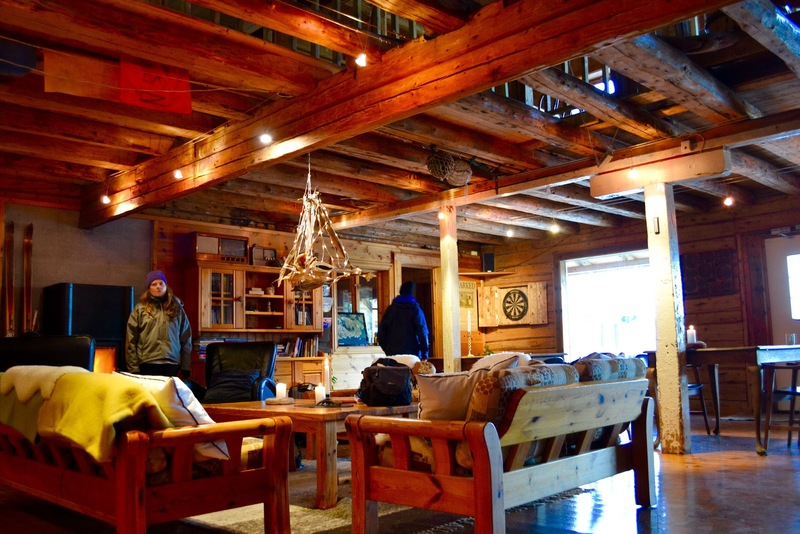 On the more casual side, Kaikroa serves up breakfast and lunch and is quite cozy to say the least. Feel like having lunch on the quay, no problem, Kaikroa will cater to your every epicurean desire. Breakfast and lunch are served in the cozy Kaikroa. This photo only: © Nyvågar Rorbuhotell. Unauthorized use is prohibited. 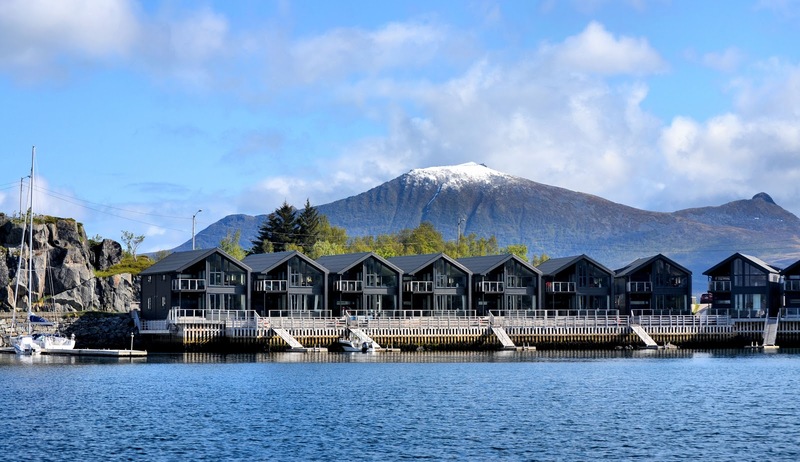 Like many of these rorbuer resorts, Nyvågar Rorbuerhotell will arrange for all of your activities planned during your visit to the Lofoten Islands from fishing and sea safaris to kayaking excursions and high-speed RIB-boat adventures on the fjords. And golfers will enjoy hitting the greens under a midnight sun at nearby Lofoten Links in Hov, about an hour and a half away. The view from Hole 2 at Lofoten Links. How beautiful is this? Imagine a golf outing here under a midnight sun. 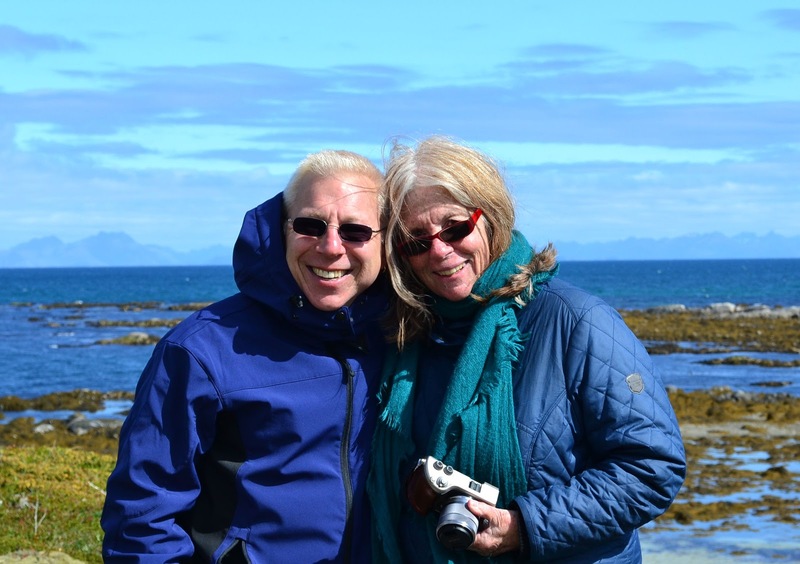 Susan and I enjoying a few links at Lofoten Links in Hov, Norway. Within the Medici Palace in Florence, Italy, there hangs a map of the known world, "Orbis Terrarum"—and at the very top, Vågar, a nearby village and at the time, the northernmost place on the map. Why Vågar in the Medici Palace in Florence? Simple, because cod came from there. 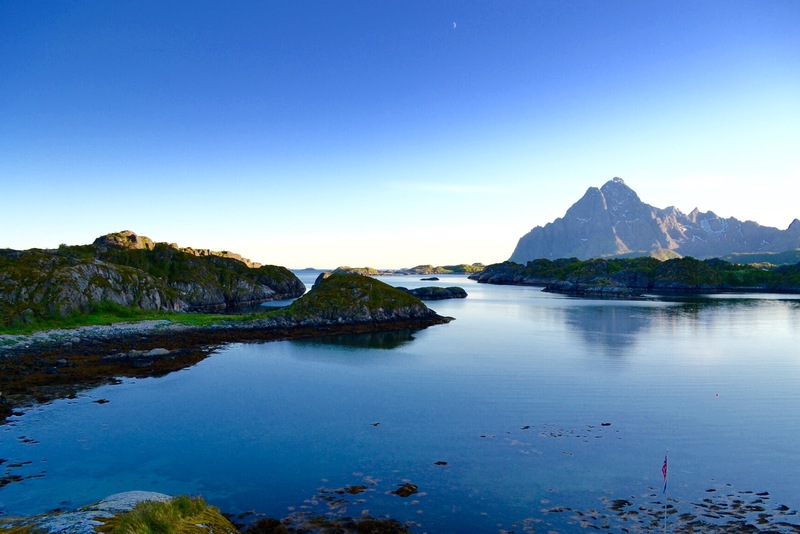 Planning to visit the Lofoten Islands? 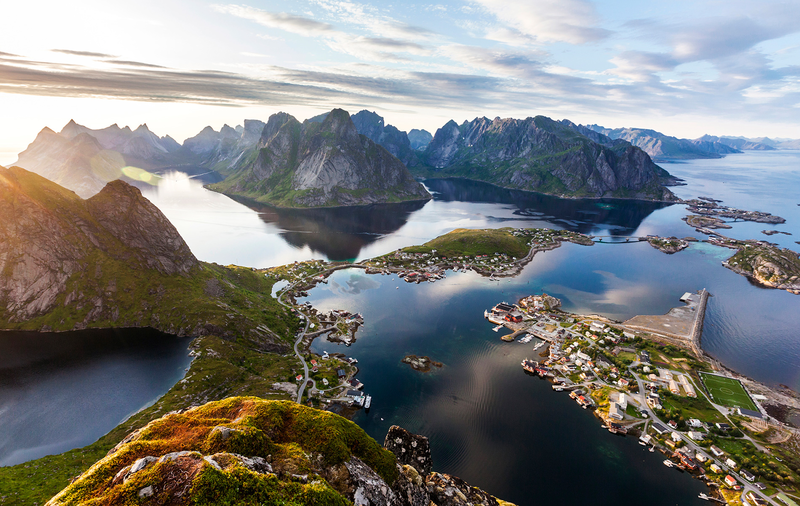 The indescribable tranquil settings and natural splendor of the Lofoten Islands in northern Norway will surely captivate all who visit. This photo taken at 11:00 p.m. from a lookout platform perched upon the bluff above Nyvågar Rorbuhotell. From rough luxe to deluxe, I hope you enjoyed your introduction to these uniquely charming and ridiculously picturesque cottages by the sea. 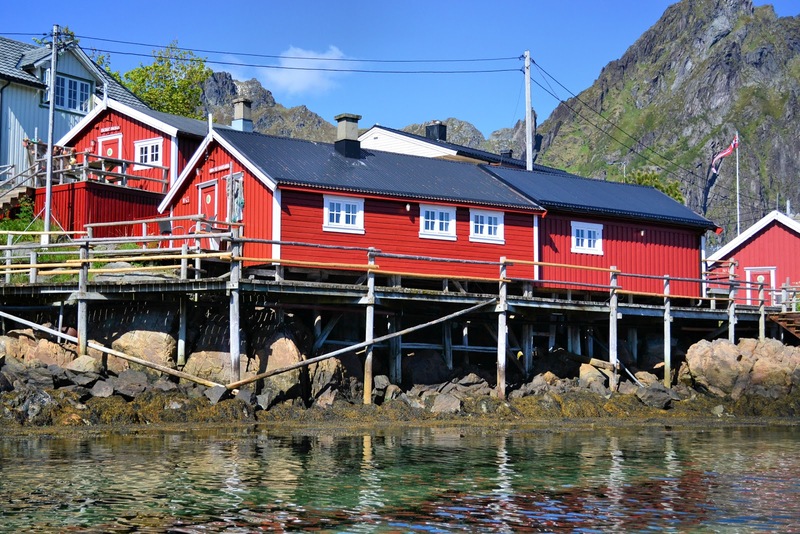 If your upcoming adventures include an Arctic expedition in Norway, be sure you seek out the rorbuer fishermen's cabins in the Lofoten Islands. I am extremely grateful to Visit Norway USA and Northern Norway for inviting me on this life-changing expedition to the land of the midnight sun! I'll never forget it! Of course, all opinions expressed herein are my own, but as for the seagulls, their opinions speak for themselves. WOW. Such incredible photos - you sure are inspiring many, many journeys. I want to go and have pinned so many photos from this article so others can see your great work! I could never thank you enough for your kind compliments and help in spreading the word via Pinterest too!! I am truly grateful! Thanks so much for stopping by and so glad you enjoyed the post! These photos! I just keep scrolling thru them again and again! Talented with a camera as well as with words. Thank you so much Becky for your kind words and compliments! I really appreciate you stopping by for a visit! 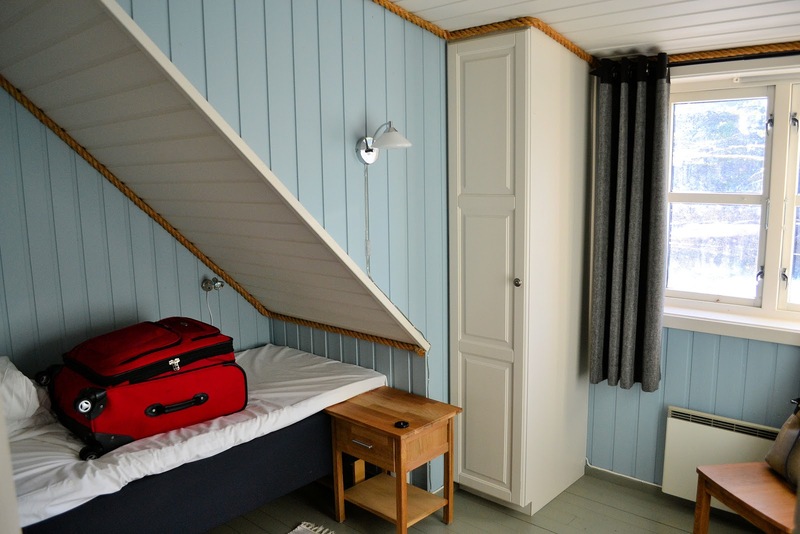 If you ever travel to northern Norway, make sure you book a rorbu cabin for one night at least, if not all! Those cottages look very cosy! 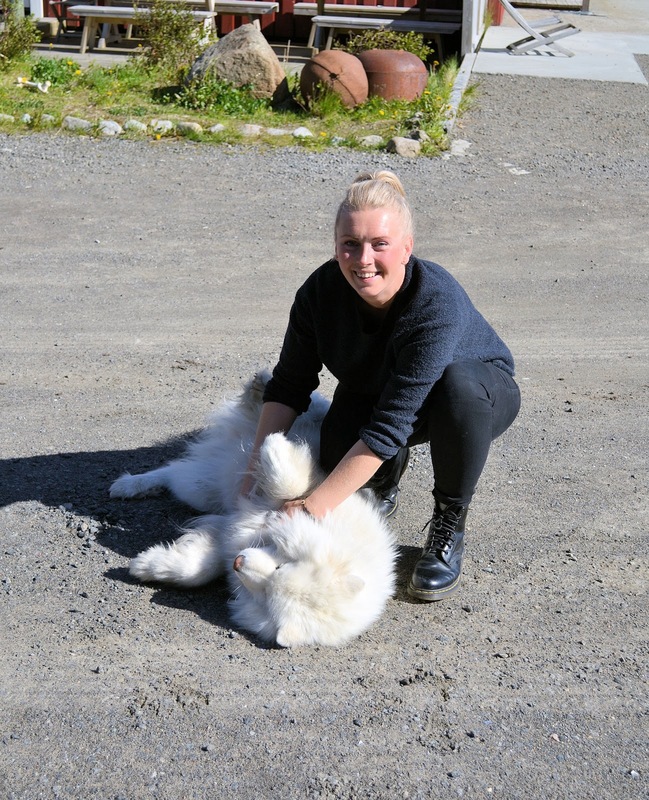 And Nanook, what a fluffly bundle of joy!